The First Punic War (264-241 B.C.) - After subduing the Italian peninsula, Rome began setting its sights overseas. Meanwhile, to the south, in North Africa, the kingdom of Carthage, which was of at least equal strength (probably greater) was doing the same. It was only a matter of time before their interests would come into conflict. Before the Punic Wars, Rome and Carthage had actually been allies, both opposed to Greece, which was the third player in the equation. Rome was fighting the Pyrrhic War (see Rome subdues Italy) and Carthage had been engaged in battle with the Greek colony of Syracuse on the island of Sicily. Both were successful and Greece's presence in the western Mediterranean receded. In fact, after his loss at Beneventum, King Pyrrhus of Epirus departed Italy with the prophetic words, "What a battlefield I am leaving for Carthage and Rome!" It began over Sicily, which was strategically situated between the two empires. Syracuse was still an independent Greek city-state and the most powerful force on the island, but Carthage had established a foothold and was gaining strength. Rome realized that another victory by Carthage over Syracuse, and it would likely control the entire island. That would be to Rome's disadvantage. The western half of Sicily was controlled by Carthage and Syracuse held sway in the southeast. It was the northeast tip, closest to the Italian mainland that was up for grabs. The city of Messana (modern Messina) was in this region and occupied by the Mamertines (sons of Mars). They were Italian mercenaries hired by Syracuse to fight against Carthage. After their service ended, rather than return to Italy, they captured Messana and occupied it for over 20 years. They essentially became pirates and raided the surrounding area, both on land and sea. Their actions disrupted commerce in the region, and in 265 B.C. 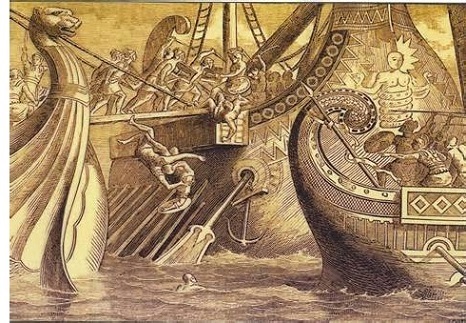 King Hiero II of Syracuse dispatched an army to capture Messana. The Mamertines appealed to Rome for aid. This provided Rome with the opportunity to intervene in Sicilian affairs. It landed an army on the island in 264 and besieged Syracuse. However, this was simply a pretext to eventually wrest control of Sicily from Carthage. Syracuse quickly made peace with Rome and became a client state, agreeing to support Roman troops. Such a move was unacceptable to Carthage and the war was underway. The primary source for the Punic Wars is Polybius, whose Histories cover this entire period. There are no surviving accounts from the Carthaginians, so everything we know comes from Roman records (Polybius was Greek who later pledged allegiance to Rome). The First Punic War (so-called because the Latin word for Carthage is Punici referring to their Phoenician ancestry) lasted 23 years. There are some striking similarities between this war and the Peloponnesian War. Carthage was a naval power (like Athens) and Rome was a land power (like Sparta) which provides an explanation as to why both wars lasted so long. In fact, at the beginning, Rome had virtually no naval experience whatsoever. However, early in the conflict, Rome benefited from a remarkably fortunate event. A Carthaginian warship wrecked on the Italian coast and the Romans were able to copy it (remember they were masters at borrowing technology). By 261, they built their first fleet. Even so, they could hardly hope to sail with the Carthaginians; so they added a device to even the odds. It was called a corvus, which was a type of swiveling bridge raised and lowered by a pulley on the side of the ship, with a large spike on the end to grab the side of the opponent's ship. By doing so, the Romans tried to turn naval warfare into the equivalent of land warfare. Instead of trying to sink it, they would sail up to a ship, drop the corvus and board it, fighting hand to hand. It also allowed them to commandeer the ship and add it to their fleet. As a result, they won their first naval battle at Mylae in 260. 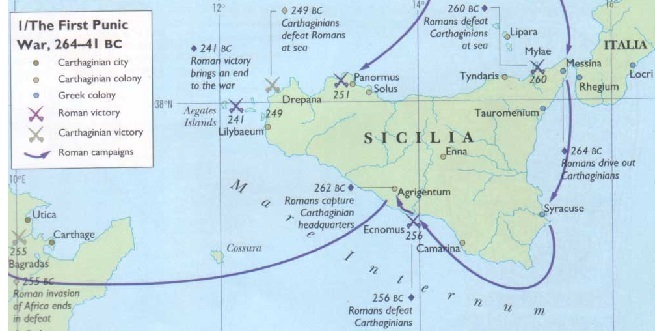 Almost the entire war was fought on and around the island of Sicily. However, in 256 B.C., the Romans invaded North Africa in an expedition led by Marcus Atilius Regulus to strike Carthage itself. They started by plundering the land surrounding Carthage in an attempt to starve the city. There is a fascinating event recorded by the Roman historians Cassius Dio and Livy during the African expedition. As Regulus was leading his troops across the River Bagradas, a giant reptile emerged from the water and attacked his men. It killed five or six of them before Regulus ordered the siege engines turned on the serpent. They finally killed it, skinned it and shipped its hide back to Rome, where it was measured to be 120 ft (37m) in length, and displayed in the Senate before disappearing about a century later. Despite initial successes in Africa, the Romans were ultimately repelled and the war dragged on for another 14 years. Although Carthage won more encounters, it was unable to knock Rome out. After 23 years, both sides had exhausted their treasuries and manpower, and the war could not continue much longer. 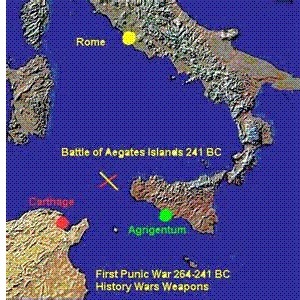 The last major conflict was the Battle of the Aegates Islands, which was a victory for Rome. Soon after Carthage sued for peace. Rome imposed heavy sanctions. Sicily was ceded to Rome, Carthage was forbidden from rebuilding its navy and forced to pay a heavy indemnity. But Rome was in no position to destroy Carthage, and the Carthaginians were too ambitious to go away quietly. One of their generals, Hamilcar Barca, had a son. His name was Hannibal...and he would become the most feared enemy Rome ever faced.